Simmons Crib Model 1404 parts needed. Or the model number could be a Simmons Model 1404 88 c5 114. I am having to make a guess on the last few numbers on the label since they are smudged and not clear. Along with the missing parts that I need, I will also need a parts list or diagram. The diagram page from the manual will help determine the sizes of the bolts that have been lost. Go here to see a variety of items available for Simmons baby cribs. Along with bolts and screws we also need replacements for the missing bars that the side goes up and down on. If anyone has any suggestions for where I might obtain a parts list and the missing bars, please contact me using the space below (and include your contact information in case I need more information). Unique Baby Gear Ideas encourages our visitors to share any resources, parts or scans of the parts diagram from their owner's manual to assist parents struggling to assemble their baby's bed. I need a copy of the Simmons baby crib model # 1404 88 200 assembly instructions. 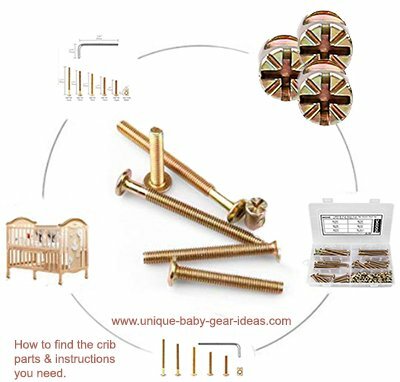 The crib is 20 plus years old and I realize that I am unlikely to find someone with the crib assembly instructions manual but I want to ask before stepping out and buying another one for my baby that is due to arrive in a few months.